The luxury apartments that can be found overlooking Central Park have been immaculately crafted to create luxurious living spaces that offer breathtaking views over Manhattan. It was therefore important to the homeowner that their beautifully designed apartment wasn't obstructed by audio and visual equipment that would cover the integrated features that existed within the home. As there was not an existing system which would be able to be installed into the home, Crescendo Designs offered a bespoke solution, which included a number of intelligently implemented features. 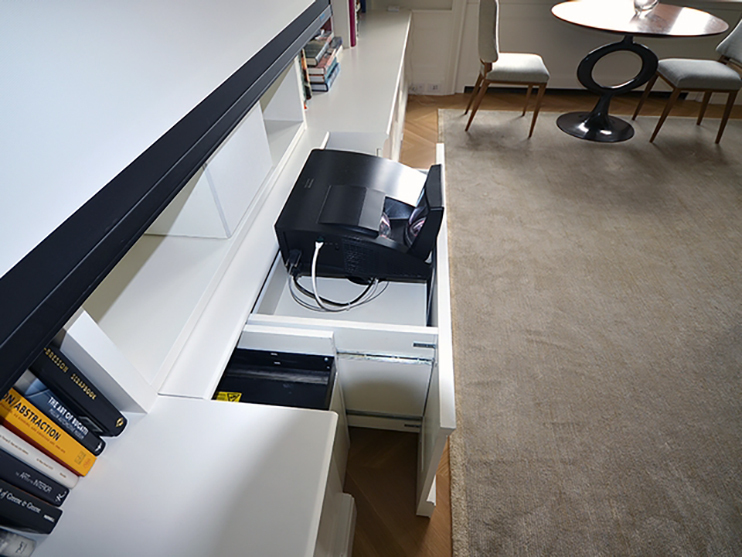 At the press of a button, the entire room transforms into a media space, fitted out with a motorised projector screen that is hidden inside the joinery on top of the shelving unit. Motorised blinds also trigger, providing an instant transformation, plunging the room into darkness for an optimal viewing experience. Future Automation's contribution to this project can be seen below the motorised screen housing the all important short throw projector. The bespoke mechanism has been intricately crafted to sit within the customised cabinet joinery, offering a seamless transformation between living space and media room. 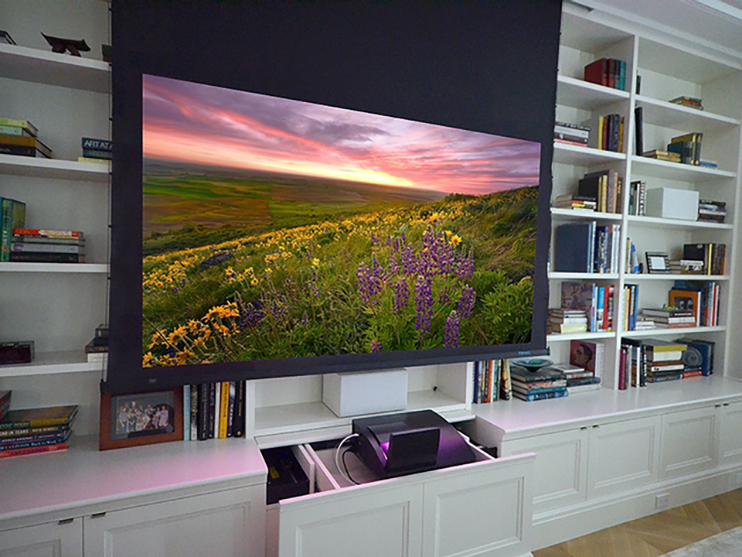 The mechanism glides out of the woodwork and lifts the projector into an exact position, accurately determined by our team to offer a consistent optically perfect projection for the homeowner. This project beautifully encapsulates the concept of dual purpose living spaces. Uninterupted aesthetics can be transformed in an instant to offer the owner an entirely transformed space which they can enjoy as both a living area and media space. Bespoke mechanisms can offer owners with ultimate flexibility to choose the functions of their room, giving more versatility to the aesthetics within the space as they can be effortlessly transformed in an instant to suit their requirements.